What To Look For & Look Out For! wrong thing & that rarely goes over too well when pride & money are at stake. Many don't want to believe it. The worst authenticators will tell them whatever they want to hear for a fee or not know the difference themselves. Many if not most authenticators seem far more interested in quick easy profit than learning their trade. Many of these predators have a virtual assembly line of aging (faking age) on the war clubs, tomahawks, beaded items, lances, etc. that they make. It is how they make a living and they sell them all over the world. Study what the verified well known authentic examples look like, artistic features, such as those in the better museums, respected collectors and those found in historic archaeological digs. That should be your first and foremost guide along with a lot of critical thinking. Then go to the better books on the subject. It should be noted some examples found in books by well meaning authors are misidentified too. Always consider how the author verified it's identification or tribal association, if at all. If they don't say how specifically, then they probably don't know. If one thing looks wrong but other things look right then don't ignore that wrong thing --focus on that! Most important is to look for the same artistic styles & shapes down to the most minute detail as found on the authentic pieces. Some will pontificate these things don't matter because they could be one of a kinds. These people usually have large collections of fakes --convinced by excuses & void of evidence. Please remember that the few pages on this website devoted to fake tomahawks represents less than 1% of the total being sold on a regular basis. If it has value someone is trying to fake it. This is only a small sample of the total & the easiest to detect. If you want to study fakes there is no more prolific showcase for them than eBay. Many dealers and auction houses are naturally concerned about making money first-- not necessarily about selling what is authentic. They are geared toward liquidating estate collections, not authenticating them. Let me also preface this section by saying reproduction tomahawks/trade axes are fine by me as long as they are marketed that way. I own some myself & enjoy throwing them once in awhile. However, when they are sold or mistaken for originals then it becomes a problem. What is a 'fake' Native American art piece? According to author Toby Herbst in Artifacts/Artifakes, "it is an object made with the intent to deceive either academically or financially. It is an object not made by the cultural group or during the historical period of which it is purported to be." Much of a tomahawk's value hinges on the 'degree of confidence' buyers have in its' authenticity. The more people that believe it is original--the more people that want to buy it. Fortunately for us original collectors, many reproductions of tomahawks/ trade axes are not identical or often even remotely similar to their originals in shape, construction or styles IF you know what to look for. But be aware that what is listed here is only a small sampling of what to watch out for! Some are cast from originals with rust & alterations added. And some are REALLY good at adding patina & aged looking hafts. Tomahawk heads by themselves are even more difficult to anaylize without the haft clues to assist. I've had some people tell me 'oh, they wouldn't go to that much trouble to fake it'--which is exactly what fakers are hoping you'll say. Some fake them purely for the fun of fooling others, or more often for big profit. There is no measure too extreme that fakers will not use. 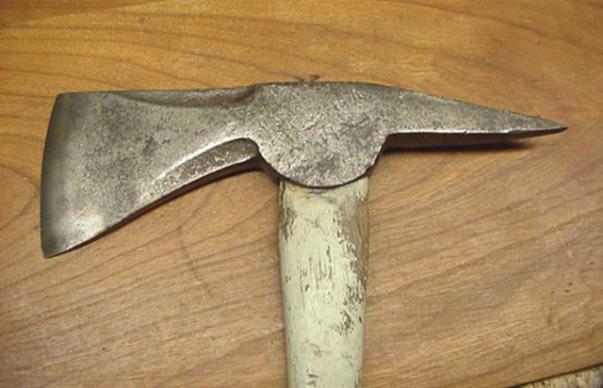 There are organizations devoted to creating tomahawks and other frontier items that appear old, most of which are not marked by their contemporary makers. Many of these have been resold over the years in estate sales and auctions for sale as originals. There are so many variables-- such as how long has it been protected in a collection. Some rare ones have been in collections for well over a hundred years, or some exposed to humid wet climate or a dry arid climate, or carefully wrapped in hides when not used or some thrown on the ground. All this requires a lot of homework on your part if you want to be proficient at telling the difference. Frankly the detective work is both the excitement and the horror of collecting! It is fun if you like to learn, but a constant burden to carry if you do not. Chemically speaking aging is an oxidation process where the artifact materials react with oxygen & water along with any other surrounding elements to break it down from the outside in. The corrosion of metals is an electrochemical process. That is, it is an electrical circuit where the exchange of electrons (electricity) is conducted by chemical reactions in part of the circuit. These chemical reactions occur at the surface of the metal exposed to the electrolyte. Oxidation reactions (corrosion) occur at the surface of the anode and reduction reactions occur at the surface of the cathode.The rate at which it degrades varies with the degree of exposure, length of time of exposure, type of exposure (electrolytes like salts and calcium ions & acids) and the availability of oxygen. All these variables do affect the appearance of the rust/patina. Much of the wrought iron in this period came from sources such as bog iron which contained more phosphorus. Phosphorus combined with iron to form a protective coating preserving it longer than iron today. Also the silicon slag (like a form of fiberglass) helped preserve it longer since it also does not degrade as fast as the more pure, yet stronger, forms of today. These impurities also could cause failures. Trying to determine age/authenticity only by looking at the degree of oxidation (patina) can be a difficult method due to this variability. Rust is extremely easy to duplicate and can be done in a matter of days & pitting in a matter of weeks. How long it was stored in a enclosed case can dramatically impact the oxidation rate as can what environment it was found in (ie. an oxygen deprived bog or a salt lake bed). For dating purposes the styles & shapes of tomahawks are more helpful, but not absolute since they have been reproduced also. Its a package plan. Everything must be considered. Does it look like it was exposed to the weather for centuries compared with known examples? How does iron, steel, brass and pewter appear after a few decades in the weather as compared to centuries? Determining authenticity requires weighing ALL these variables as a whole. You will find I am very limited on what I can divulge in a public forum because those who fake them are listening in & anxious to hear what they need to fix. My goal here is to get you to think, experiment, consider, & learn. 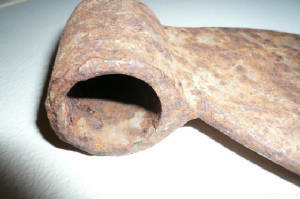 This modern reproduction gun stock war club showcases how the pitting of iron can be reproduced. Pitting can be & is faked. Here is an excerpt from a recent book about how to reproduce antique car parts who makes reference to his best friend being a American Indian Artifakes maker. The statement is very true. Those that make the best Indian artifakes know exactly how the originals appear up close & that is what they reproduce. The 3 images below here describe a so called 'spike tomahawk' that has been misidentified by some & perpetuated by other websites. It is actually a wrought iron scythe tang. 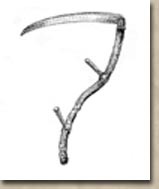 On each scythe there were usually 2 wooden hand grips called nibs. The loop went around the scythe shaft & the tang inserted in the wood handle (nib). The end of the tang would be peened over the wooden handle & when the wood disintegrated this was what was left. Often the little peened over tip would rust off to leave a sharp end. They average around 6.5" long. There is one pictured on page 41 in the book "Hooks, Rings & Other Things; An Illustrated Index of New England Iron, 1660-1860" by Frank T. Barnes, 1988. 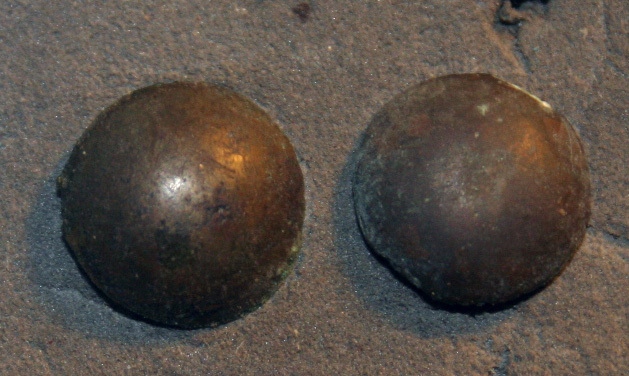 The book "A Museum of Early American Tools" by Eric Sloane, 1964, also shows examples of these tangs on page 104. There is also a photo below of a dug specimen from an 18th C. farm. Not everything with a point is a tomahawk but many have been sold as such. Can you tell which brass tack below is 200 years old & which is the modern 6 month old one I artificially aged? Brass tacks had square brass shafts during the fur trade but they are still being made that way for reproduction work. 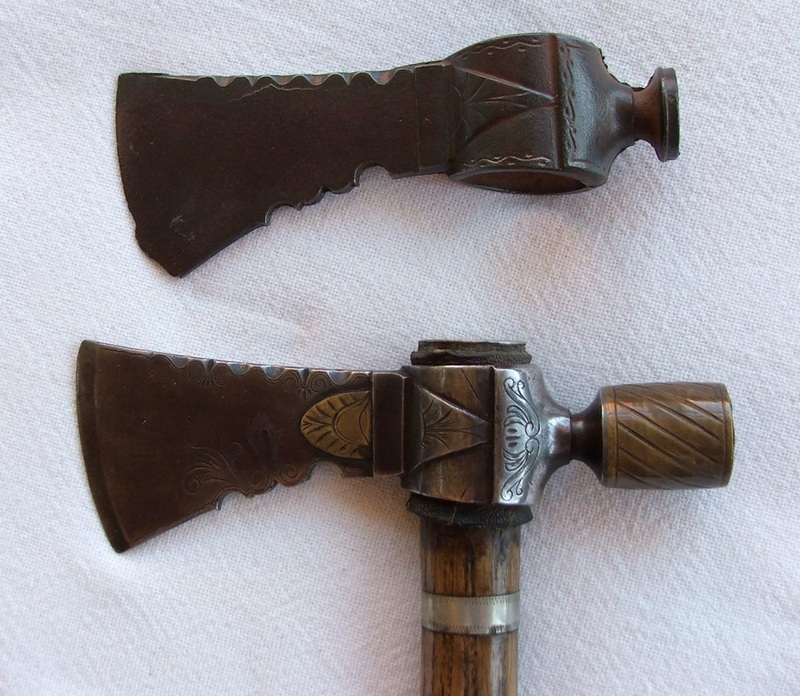 18th and 19th C. hide trunk tacks have also been reused to give an axe that "Indian" look. Modern tacks are very easy to age as can be seen in this photo below. 20th C. brass plated iron carpet tacks with round steel shafts are often used on fakes as well but are much easier to detect with a rare earth magnet. Most trade tacks were solid brass with square brass shafts --despite what some will tell you. A few later 19th C. pipe tomahawks have brass heads with square iron shafts ca 1880's & at least one I have examined had brass tack heads with round steel shafts soldiered on. 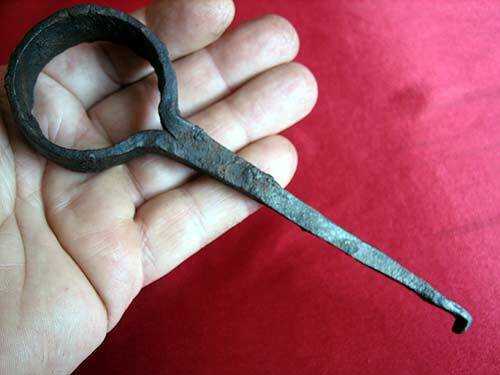 While there were some steel square shafts soldiered onto solid brass heads were being made by the Civil War period for use on other things, few Indian artifacts will have them. They just didn't tend to use them for the most part. You won't find plated brass tacks on authentic period tomahawks or other period Indian artifacts no matter what kind of shaft they have. Don't let anyone tell you different. Plated brass will strongly attract a magnet about the same as an all steel one. A steel shaft on brass head will have a very light barely detectable pull & attract to the center or head but not the edge. You can practice on each to be sure. Thousands of original old brass tacks have been resold to fakers as well. THE ONE ON THE RIGHT IS MODERN. These are cast iron reproductions that were made beginning circa 1920's for some to 1940's for others. Some had turtles, bears, indian faces and some had wolves cast on their faces. These were used at pow wows and sold as souveniers with and without handles in the Minnesota region. Several of these have been mistakenly taken for authentic in "Indian Tomahawks & Frontiersmen Belt Axes" by Hartzler & Knowles, pg. 217-218 and id'd as "Delaware bog iron axes". The authors provide no provenance or explanation, nor does any other publication. Once a mistake like that gets published it becomes fact to readers who never question it. in American Indian Tomahawks Peterson describes one as a 20th C. possibly fraternal #204. Bog iron was a very impure low quality form of iron ore originating from old bogs/swamps during colonial times on the East Coast of N. America, such as the Saugus Iron Works in Massachusetts, from the 1600s on. Bog iron is not a forging or casting process-- it is a type of ore used in blasting furnaces & foundries to make the iron itself into a usable form, such as pig iron or billets of wrought iron to be later made into objects. The axe below looks kind of like a tomahawk....can't think of what else it could be? The size is right...Must be a tomahawk! Well that is the mistake many people make when faced with an unknown & anxious to make that deal that seems to good to be true. The handle is obviously new and the spike is a bit too fat and blunt. 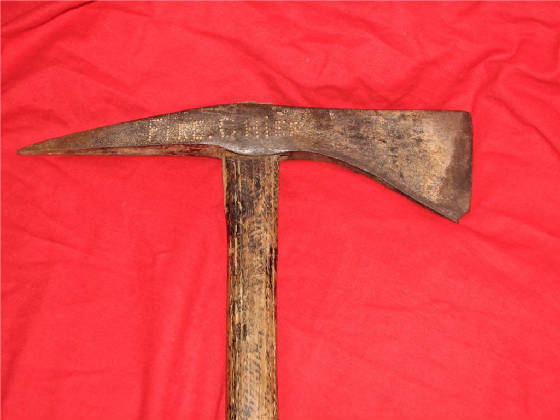 A closer look will show that this axe is faintly marked Peck Cohoe which was 2 axe companies in NY & CN which briefly made axes together between 1880-1886. * By 1880 nearly all Native Americans were on reservations or living among the whites peacefully so there wouldn't have been much of a trade going on for these then with Indians or whites! 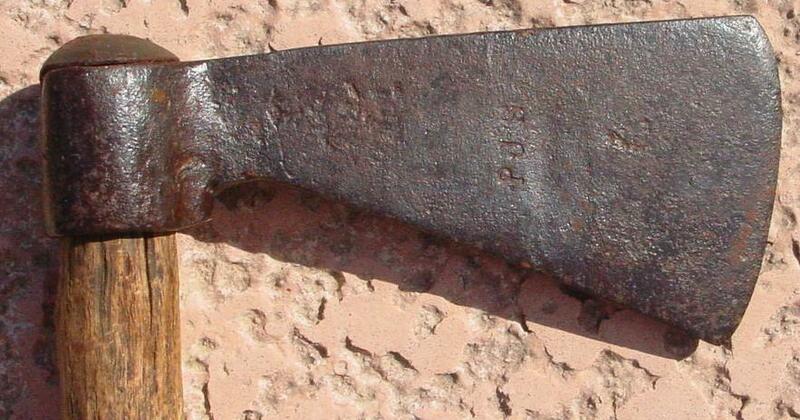 This was probably used as a mining hatchet or as a fire hatchet for breaking out windows in narrow hallways. But you don't have to know what it is to know what it is not. *Directory of American Toolmakers by Early American Industries Assoc., 1999. Below here is a spike something. Could it be? 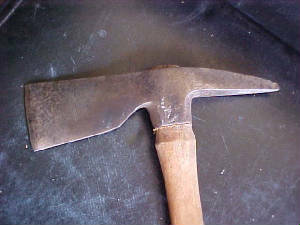 The faint marking on the head shows "Plumb" with the Anchor brand. The Anchor brand for Plumb axes was not introduced until 1890* so once again the time period doesn't fit the trade period. The style is more common to late 19th C early 20th C. axes. It has no evidence of serious rust in the past (remember that Native Americans didn't have too much oil & steel wool handy to keep their axes rust free) although that in itself is not enough to rule it out. 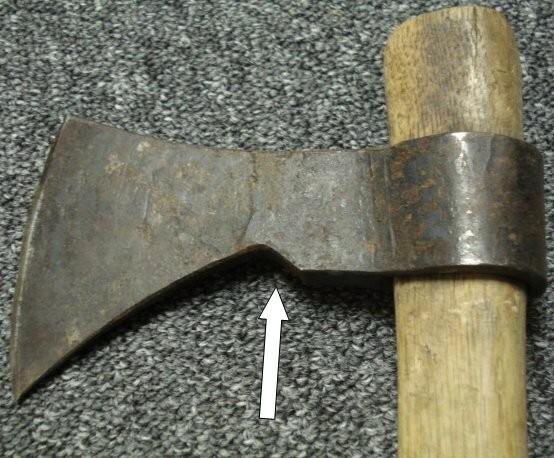 The extended 'adze' type eye also is more of an early 20th C. trend in axes and hammers. 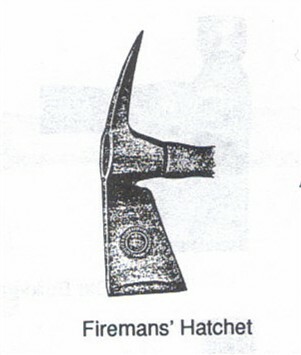 This is identified & pictured in "Dictionary of American Hand Tools" by Alvin Sellens as a firemans' hatchet which was taken from an old Plumb tool catalog. The major defining attribute is the deeply notched thin blade and extended eye socket. *Directory of American Toolmakers, Early American Industries Assoc., 1999. Below here is a drop forged hatchet instead of hand forged. The symmetrical hollows in the head are virtually impossible to duplicate with simple hand files & standard smithing hand tools and totally unnecessary in a spiked tomahawk. 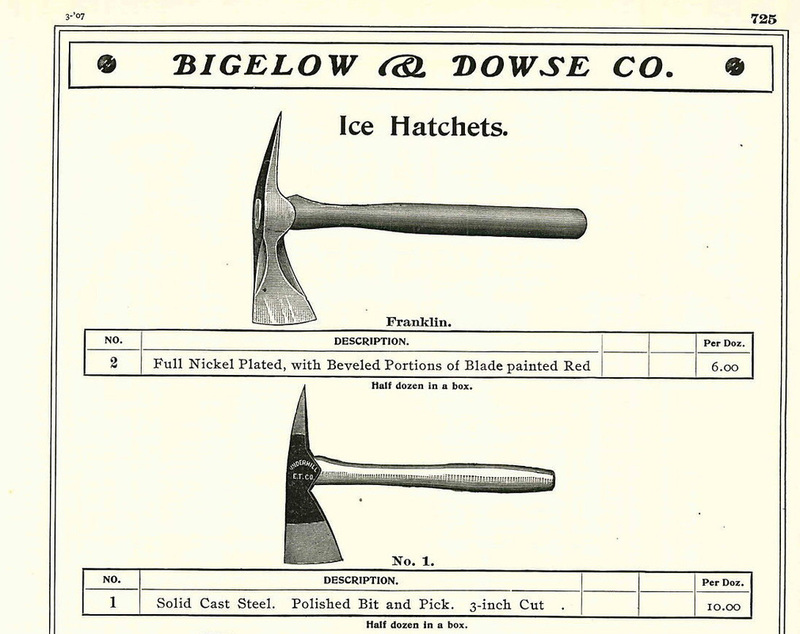 I have seen this one listed as a ice hatchets used in the home for those ice blocks in a 1919 American Axe & Tool Company & a 1907 Bigelow & Dowse Co. catalog. Homeowners didn't have ice cube trays so they chipped off small pieces of ice off the block in their ice box to add to drinks & pitchers. They were marketed at the time as both fire hatchets & ice hatchets. This style allowed the blade to be lighter while still maintaining the edge thickness and lower friction. Obviously those painted red were used as fire hatchets-- tomahawk heads were never painted with fire engine red paint. Seriously. All this is not to to say that none of the these were ever used by Indians/frontiersmen-- simply that without provenance there is no evidence to support that. The book "Indian Tomahawks & Frontiersman Belt Axes" by Hartzler & Knowles, 1995, has one of these pictured which has the head sewn in rawhide although no provenance is given. If it is an authentic example of the period then it would have been a case of a tool being converted to a weapon. 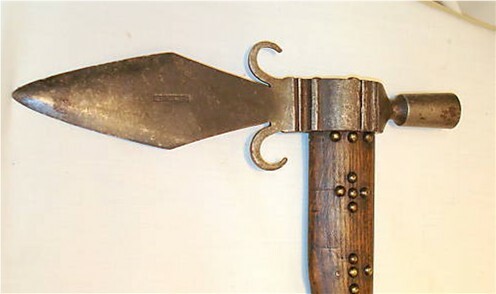 Fakes however are also often decorated with rawhide and tacks and converted into weapons. Authentic spike tomahawks very very rarely (closer to never) have rawhide holding the heads on. There certainly have been rare finds in Indian grave excavations where common axes such as shingle hatchets & lathing hatchets, etc were found with them, but so were hoes. It would be a ridiculous assumption to look upon ALL shingle, fire, ice and lath hatchets as Indian or frontier weapons. Unfortunately some have made that assumption. I think of this as a sort of mirage affect but psychologists term this as Apophenia, Confirmation Bias or Pareidolia --somewhat akin to seeing the face of Jesus on your morning toast or air force military flares as alien spacecraft. Its a natural human reaction which some are more predisposed to than others & something everyone needs to guard against. Skepticism should be an ongoing, self correcting process. Otherwise it is just falsely confirming your preconceived opinions. Years ago I remember looking at a table at a artifacts show with an unusual item people were trying to guess what it was. One guy who collected colonial items thought sure it was a colonial piece of some kind. Another guy who collected early Indian items thought it was definitely an early Indian related item. Both made seemingly convincing arguments. Then the owner of the table stepped forward with a big smile saying it was neither. He had made it last summer to carry his display cases in. ;) Well, what can you say. Sometimes it ends up being whatever people need it to be. 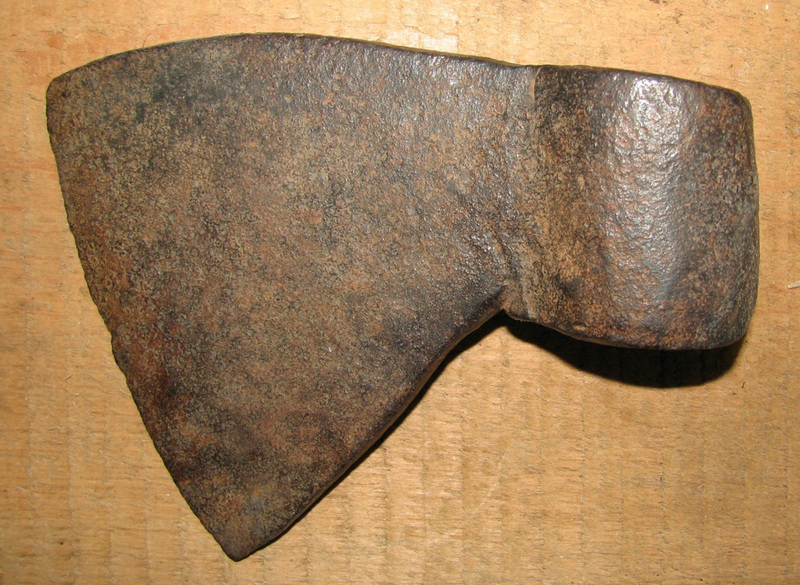 This style fire hatchet below has made it into Indian trade collector books and tomahawks books as spike tomahawks. 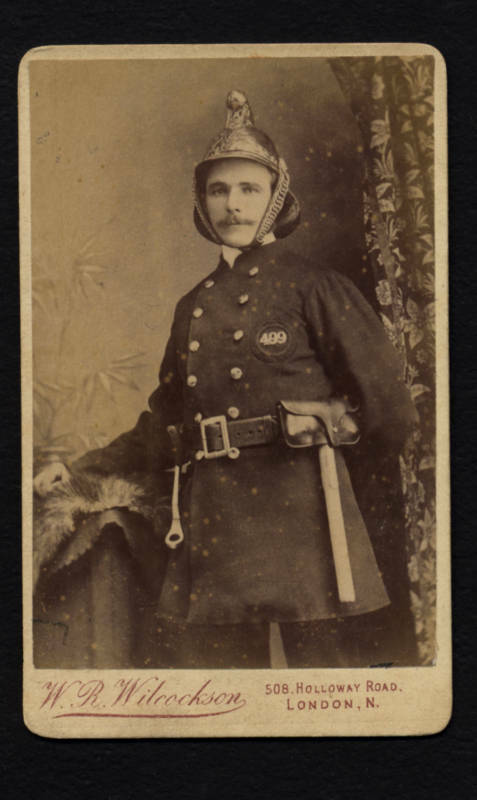 ...well I suppose if the Indian was working as a fireman at the time but ah....no, not a tomahawk. Drop forged, not hand forged. Unfortunately none of the authors of these books was expert in other types of tools of the period. 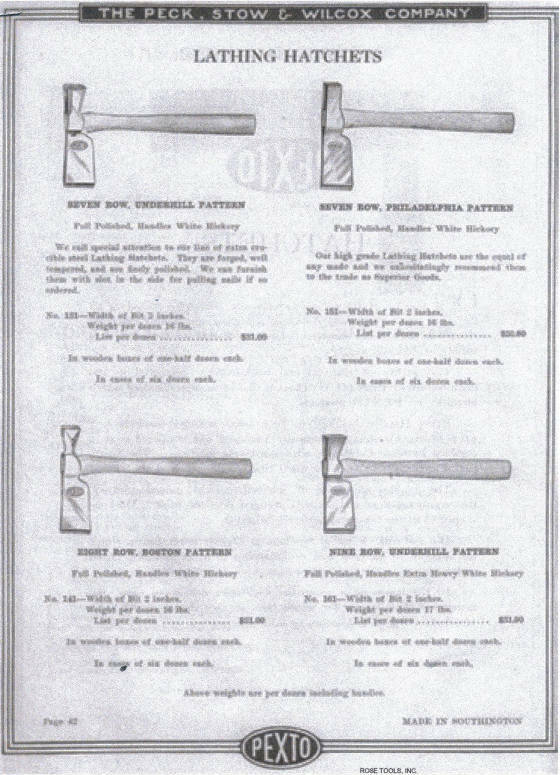 This pattern was marketed also as an ice hatchet. 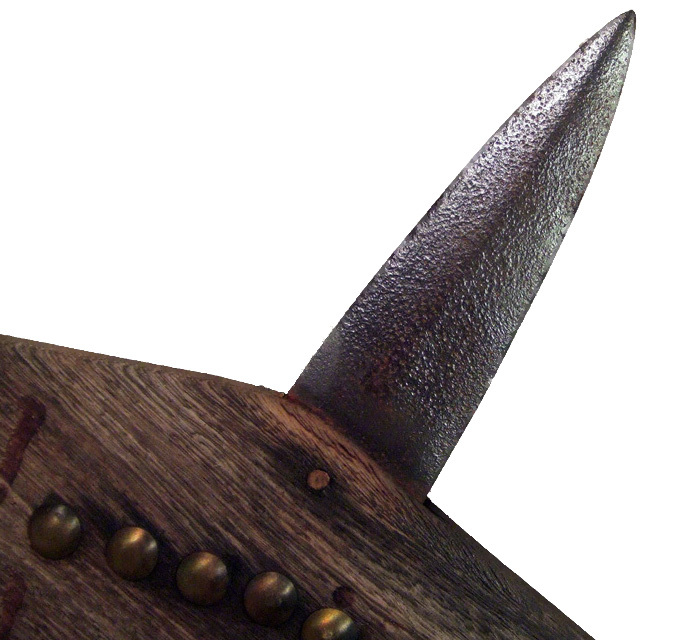 This brass spike axe called a levante was made in Hungary in the 1940's. It is of interest to us not because it is an American Indian tomahawk, but because it is a discerning look at that patina. Even had it not been marked the weight and thickness and material would have told us it was not used as a tomahawk. 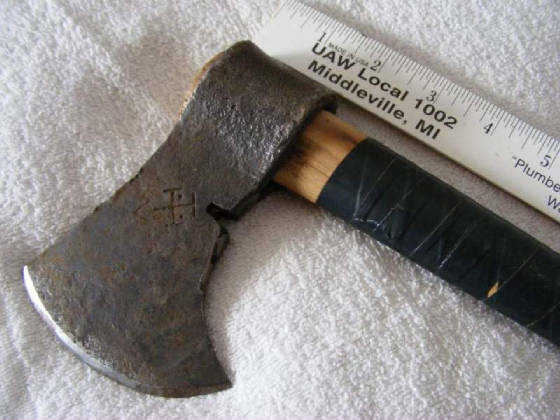 Some go so far as to assume if they can't identify it as a 100% hatchet tool then it must be considered a potential tomahawk-- ironically from people who are not tool collectors. That is definitely confirmation bias at work. 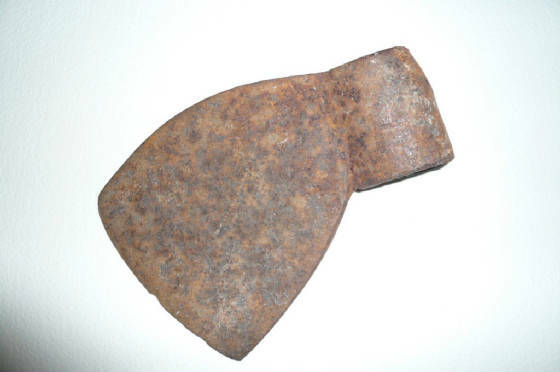 It is also important to point out that very early lathing hatchets and other polled hatchets in Great Britain, Eastern Europe and France looked far different than the ones in America or Canada. Becoming familiar with all of them helps tremendously before identifying polled tomahawks. 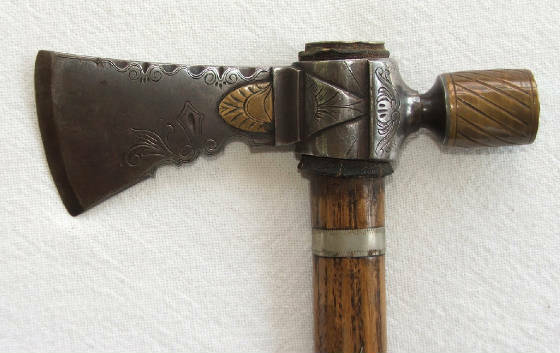 I doubt any 18th or 19th C. Bulgarian polled hatchets ever saw use as a tomahawk, but how many would know what one looks like? (See also Hibbard, Spencer, Bartlett & Co. tool catalog 1922, 'A Museum of Early American Tools' by Eric Sloane and 'Dictionary of Woodworking Tools' by R. A. Salaman, 1975, 1902 Fayettle Plumb catalog). however upon closer inspection the head is 13" long. Documented spike tomahawks have reached widths of slightly over 11" but none any longer than that are known to me. Its important to consider the size of any spike tomahawk in it's length AND in its weight. These were made to be carried on the person who traveled in the woods, so a heavy unwieldy spike tomahawk slapping against your back when you run dodging trees might not be such a good idea. Not to say some were not made in experimenting around but it is unlikely to see them over 11" long & over 1 1/2lbs. In addition, there are the words "FIRE CHIEF" marked on the side of the axe which would indicate a different use for this particular one. The spike axe below is very unusual in form but not out of range of size to a spike tomahawk. the marking on the side of the axe reads "CB &Q-B". Further research indicates this stands for Chicago, Burlington,and Quincy Railroad in Burlington, VT. What it could have been used for in that capacity is a mystery to me --but a tomahawk it is not. The pipe tomahawk below is a contemporary made by William Buchele complete with silver and brass inlays, and an ivory mouthpiece. William Buchele is coauthor of the book "Recreating the Kentucky Longrifle". This tomahawk sold in 1990 at a Sotheby's in New York as an original, presumably by accident, as a"Potawatomi Ceremonial Pipe Tomahawk Circa 1820". The third picture shows the casting copy next to a completed head. Just because it starts out as cast iron, doesn't mean the surface can't be filed and polished to look like forged steel. Look for signs of having been smoked by removing cleanout plug, looking inside bowl, remove head if possible to see if wood hole is burnt. Often these hafts would need to be shortened or replaced because the wood would burn out where the hole was. Of c ourse even repros are occasionally smoked at times. This spontoon pipe tomahawk was made in the 1940's & still made today. It often shows up in the "authentic" market. This particular one is marked "I. & H. Sorby" in a cartouche --a mark that has been reproduced on a number of fur trade repros including HBC daggers. ANY trade mark can be reproduced especially with todays computerized machines. Some are getting very good at it, but the other elements of the axe give this one away regardless. This shape is still being reproduced & sold regularly as an original. Anything that could be made then can be made now. On the axe below, notice how the notch is more than 1/3 of the way forward of the eye? In the originals they always had the notch close to the eye. Also the thickness on this one is about half as thick or less than the originals. 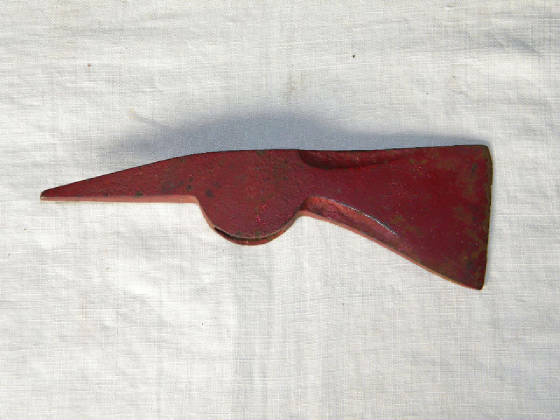 This one was made in Pakistan or India & has no patina at all, but rust is easily added. Now some of the reproduction people, especially in the U.S., try to make them more like the originals so these criteria will not work all the time. There are some exceptions to the location of the notch in authentic trade axes however it is best to avoid them until you are very experienced at recognizing them. All these pipe tomahawks are hand forged in India brand new. There are sellers who sell only these artificially rusted & sell them for thousands--each. Some don't even bother making a different haft. They will never go away, they will continue to be re-sold as originals for centuries to come. And this is only a small sample of them. Its the same with spears, lances, arrowheads, arrows, war clubs, trade silver, etc., etc. Photo courtesy of Crazy Crow Trading Co. 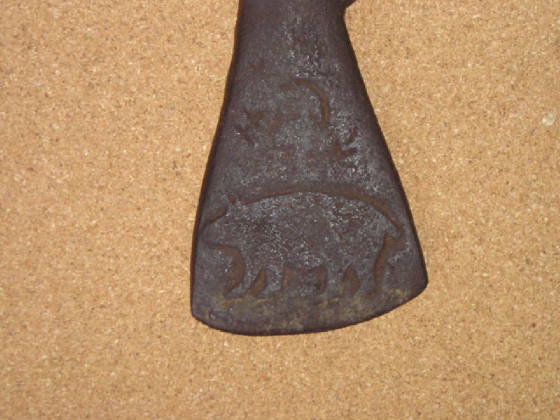 This trade axe was represented as having been dug from a battle site but it has a few problems. 1) It is very atypical in that the top profile is not flat as shown by the arrow. 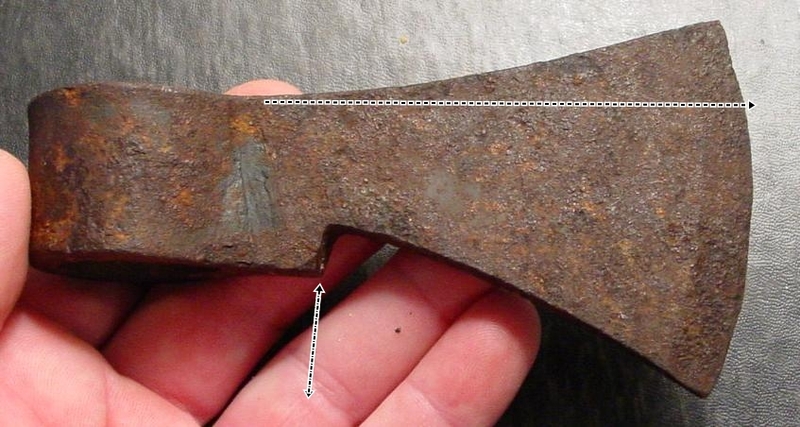 3) The pitting & wear do not look nearly as advanced as an original one. There are some spots not rusted at all. This kind of rusting & pitting might be found in one 30 or 40 years old at best. There is more I could say but I don't want the fakers to know that information either. It certainly could have been dug from a battlefield, but it wasn't there more than a couple of decades. Time didn't stop at the end of the battle. More and more I hear of reproductions of tomahawks being found or at least claimed to have been found. No doubt that number will only climb as time passes. 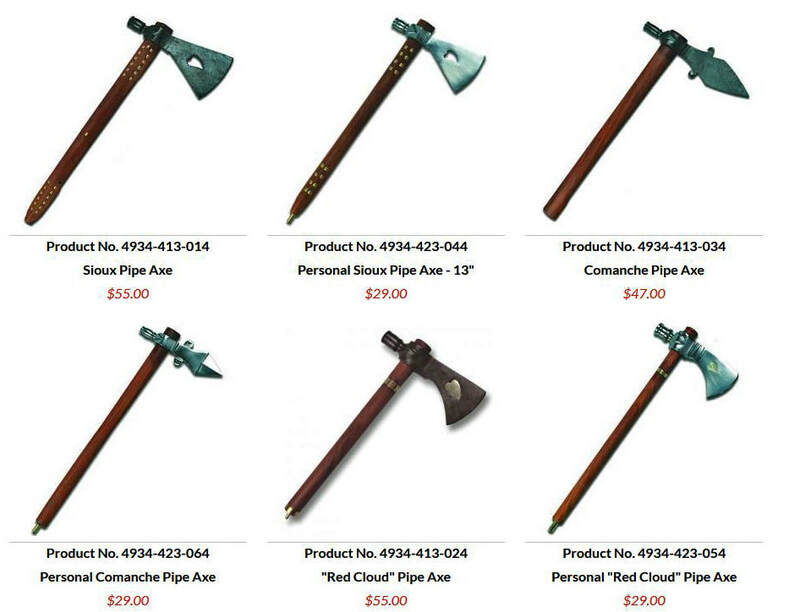 Many of these old South American trade axes shown below were made in the U.S. & then sold to foreign countries and in recent years have made the trip back to be resold as "Indian trade axes". Unfortunately, none have been documented to have been actually found at archaeological sites here in North America that I have been able to find. 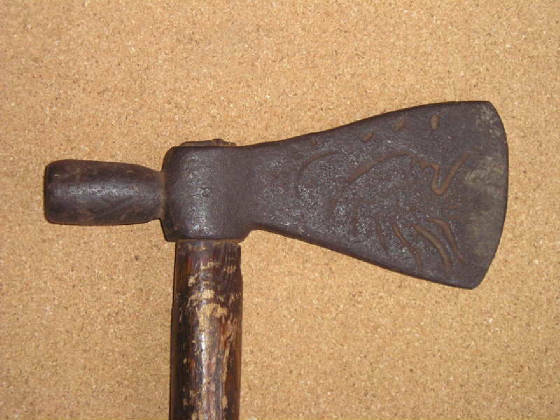 The Collins Axe Co. made many of these specifically for the South American trade and even had a branch of the company in Mexico that also made this type. No doubt their primary advantage in those countries was that handles could be easily made from branches that fit their round eyes--just as the round eyes on the ones made for this country had the same advantage in our early history. In recent years many of these old South American axes have been imported to the U.S. to subsidize the fake trade. I once saw a photo of these old imported South American axes stacked as high as the man standing next to then on the American dock. Hey, this next axe looks old, doesn't it? Thats why patina, or your perception of patina alone is a poor way to estimate age. The trade mark below is from Jim DelaRonde Forge who has been making well made legitimate quality reproductions of fur trade axes, tomahawks and pipe tomahawks for more than 35 years. He also has the mark JD over XLS in a square cartouche. A number of his old reproductions have been turning up on ebay, (2 this week), as original fur trade era items. There are hundreds if not thousands of blacksmiths, both amateur and professional, making tomahawks worldwide and most are not ID marked by them. After they are used in the outdoors by reenactors for years they take on a rusted patina fairly quickly. Of course some are deliberately rusted to be resold as originals. The R. E. Davis Co. makes & sells a wide variety of reproduction cast pipe tomahawks, axes and spike tomahawks which should be studied closely on that website and in person whenever possible. A large number of the reproductions being sold as originals in the market today are from their stock of the last 30 some years. Apparently 2 of their patterns belong to them and the rest are purchased from some other source. Their cast iron is of some high quality 4140 stock & may or may not have a highly polished appearance. While there are characteristic details evident in these I'd prefer not to publish them so the fakers then know how to remove them. By studying all the reproductions closely, (i.e. where are the moldings, flutes, angles, notches, etc.) many fakes can be ruled out. One of the favorite ways fakers have used in the last 20 years or so particularly is using the repros cast from originals which had heavy pitting. Then they add 'patina' to it, and may change the bowl or re-file it enough to make it look different. Wolla! A genuine old looking fake. Many of these even make it to large auction houses where they are sold as originals with no one the wiser. Here is an old ice axe head with a modern replacement haft artificially aged to look old. Looking at lots and lots of verified authentic fur trade tomahawks certainly will help you learn what to look for and what doesn't quite fit the profile. Looking at the reproductions also helps. Here are some references that may be helpful in filtering the fakes from the genuine articles. Most do not specifically mention tomahawks but they do explain the problems, legalities and some ways that Indian artifact fakes are made and can be avoided. Artifacts/Artifakes; The Proceedings of the 1984 Plains Indian Seminar, publ. by The Buffalo Bill Historical Center, Cody, WY. 1992. How Do You Know It Is Old; A Practical Handbook on the Detection of Fakes for the Antique Collector and Curator by Harold L. Peterson, Charles Scribner's Sons publishing; 1975. Canfake; An Expert's Guide to the Tricks of the Canadian Anitiques Trade, by Donald Webster, Curator Emeritus, Royal Ontario Museum; McClelland & Stewart, Inc.; 1997. Fighting Iron; A Metals Handbook for Arms Collectors, by Art Gogan, Andrew Mowbray Publishers, 1999.